There are days when the pace is slow in the studio, and then there are days that things are a little more hurried and frenzied. Sometimes painting for me becomes an emotional "working out" of my mind's ruminations. What's going on in our world, the interpersonal relationships of my own family or friends, the steps forward and backward in my relationship with my Creator...sometimes they all get tangled together and come out in an explosion of activity. The last two days were like this. While the image above shows a somewhat organized space, I assure you, mere moments before the image was taken there were puddles of paint, brushes, mediums, spray bottles, palettes, and a plethora of other goodies just lying around after one of these frenzied painting sessions. I spilled a cup of dirty paint water, my cat broke a glass palette, and I soiled at least one pair of socks and one pair of shoes before it was time to call it quits for the day. Today I painted about my relationship with my oldest son, Lenten reflections of ashes and the book of Genesis, healing from pain, good things coming from God, hanging on to proverbial "ropes" of hope, our patched and broken culture, and lastly, freedom of movement and expression in dance. Perhaps next week will gift me with more jeweled moments of time for the opportunity to further express my ruminations. Create on, my friends! Last Sunday, I was dreading my drive to Southern Indiana to deliver artwork for a show in Madison. I wanted to spend the day with my family, doing the things that families do on Sundays. I wanted to relax, I wanted to have my glass of wine, and I just wanted to be lazy. However, a deadline is a deadline and off to Madison I went. Not long into my journey, my loathing became contentment as I passed through the pleasant little town of Greensburg, Indiana. The town is home to a Honda Motor Company manufacturing plant, along with a number of other manufacturers, including Delta Faucet and the automotive supplier Valeo. The town was clean and easy to navigate, and although it was not my final destination, I truly enjoyed the journey from farmland, to small town, and back to farmland again, as I continued on my way down Old Michigan Road to Madison. Soon, I passed by Carolyn's Collectibiles in Holton and was amused to see her eclectic collection of antiques, furniture, signs, and other fun things. I continued on my way, taking in the glorious creation all around me. Goodness, I can't even begin to tell you how beautiful it was. Hills and valleys, covered in greens, yellows, and the orange hues of autumn, all washed in the crisp air and glorious sun swept sky. A little further down the road, I was met with farm after sprawling farm. I could have painted them all! Up and down the hills, and I was soon passing the Big Oaks National Wildlife Refuge, located on the Jefferson Proving Ground land. Big Oaks is operated by the Indiana Air National Guard and sits on land that was once a World War II era munitions testing facility. Although it is now home to over 200 species of birds, and 46 species of mammals, I didn't care to visit the grounds today, as I would have had to sign an Acknowledgement of Danger form, due to its past use, and the presence of unexploded ordnance (UXO). Finally arriving in the historic rivertown of Madison, I was met with thousands of people who had desended upon the city for the 2017 Madison Chautauqua Festival of Art. Strolling through the tree-lined streets of Madison's National Landmark Historic District, I saw hundreds of displays from artisans, musicians, and food purveyors. The original festival dates back to 1901 and has grown through the years to become one of Indiana's finest festivals. I certainly hope that I can bring my family back next year. My last stop in Madison before heading back to Carmel was at Art on Main, the gallery where two of my paintings would be put on display for the next month. I was happy to see what the artists of Southern Indiana had been creating. Wonderful examples of the charm inherent to the area's people, countryside, and riverfront filled the gallery walls. If you are heading south to see the colors change, please consider stopping in at Art on Main, located at 309 W Main Street in Madison. I'm often asked the question "How can I become a better artist?" Or, "I can't draw anything. What can I do to get better?" My answer is always the same. Practice. Practice. Practice. Remember when you were learning to ride your bike? Or learning to walk? Or for goodness sake, do you remember learning algebra? All of those things took practice. Without practicing your craft, there is no way to improve. Do you think an olympic gymnast can just go out and pull a double-twisting double back and stick it? Nope. They train for 30 hours a week to improve their skills. So, if there is one thing you could focus on to improve your art, I would absolutely recommend for you to draw. Every. Single. Day. And it doesn't have to be a lot. Below is a book I recommend to my students who are seeking to improve. It is a very small book, and can be carried anywhere you go. Just bring along a pencil, and you are golden. Now go on. Get out there and draw!! If you are interested in purchasing my book recommendation, may I ask that you click through the link below to Amazon, as I am part of their Affiliate Program, and will receive a percentage of the sale. This will help to keep me in the business of being creative! Well, one of my professional groups made the challenge, and I accepted. Paint 30 canvases in 30 days? Sounds impossible, and for this artist, it was. Looking back, I'm thankful I "changed" the rules to state that I would "start" 30 canvases in 30 days, but I wouldn't be held to completing them all within that timeframe. SO, I guess you can say that the challenge was successful. And I'm thankful for that. In totality, I have completed (or almost completed) 18 of the 30 and most all of those canvases are being entered in shows or are currently on display in a gallery and will be sold as prints or licensed for use on home goods. I am truly humbled by the encouragement I have received for this challenge, and I hope to finish those last 12 canvases in the coming weeks. Although, let's be real. I serve my God and my family first. So, the canvases are at the mercy of doctor's appointments, soccer carpooling, dinner making, ballet classes, and on and on. Until next time, Peace! 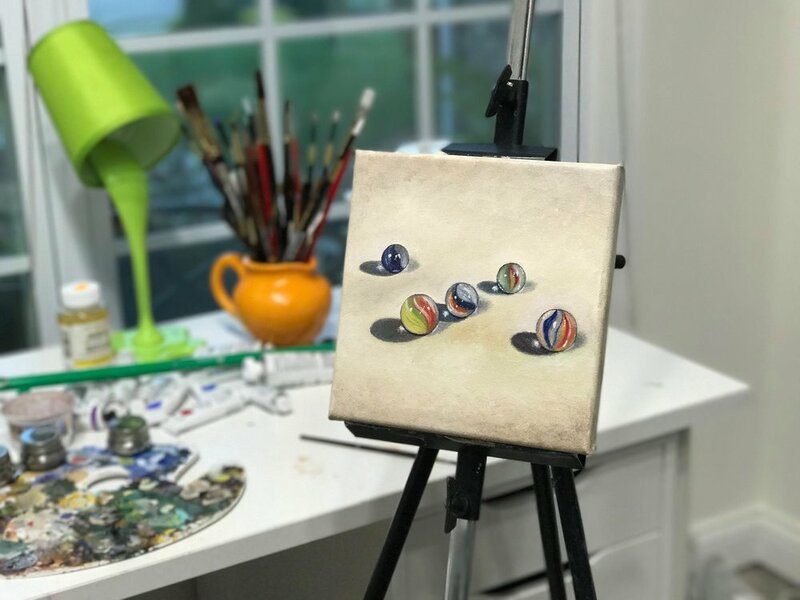 The Marbles, 8"x8" oil on canvas. Hopefully will go on display in Key West, Florida later this October!